In today’s world, a restaurant that remains in business past its first year is worthy of congratulations! Reaching the average restaurant lifespan of 5 years is praiseworthy; ten years, successful! What do you say about a restaurant that’s been in business over a century, surviving challenging periods in history such as prohibition, the Great Depression, world wars, and the recession? The Berghoff, one of Chicago’s oldest restaurants, will be celebrating 120 years in business under the same family’s ownership this year. DANG, that’s quite impressive!!!! The natural thought goes to what’s their secret? Herman Joseph Berghoff after receiving the first liquor license issued by the city of Chicago after prohibition ended. Founder Herman Joseph Berghoff, a native of Germany, opened The Berghoff as a small saloon in 1898, to serve his Indiana brewed beer. When the national prohibition threatened to shut down his thriving business, insight prompted him to begin brewing and serving the legal near beer which contained less than 0.5 percent alcohol. He also wisely expanded his services and turned The Berghoff into a full-service restaurant. 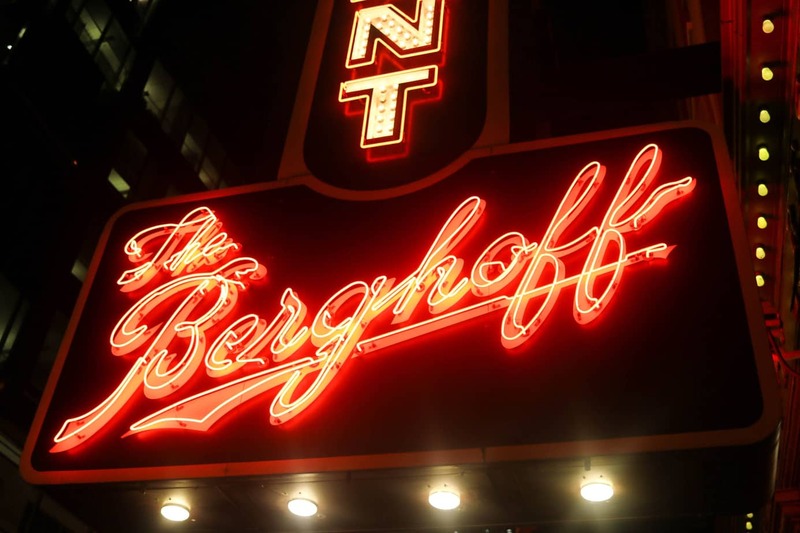 After Prohibition ended The Berghoff was the first establishment to receive a liquor license from the city of Chicago. That tradition continues every year. Over a century later here I am dining at the restaurant located at 17 W. Adams, the location since 1913. Old world vibes abound as it appears nothing has changed. The rich history of the building is fascinating with much remaining from the 1800s; the bar room and recently refurbished bar, paintings, murals, stained glass, fixtures, and the floor to name a few. Pictures of the Berghoff family and historical moments throughout the years line the walls. It has a certain warmth. Prohibition-era advertising of Bergo soft drinks Until 1980, Berghoff waiters operated on the Old German system of coins. Oh, the memories that this restaurant must hold for families who’ve been dining here for years and generations! As the older generation passes on, the younger generations keep the family tradition alive by continuing to celebrate milestones, and achievements here. I wonder if my grandparents ever dined here? This place reminds me of them. One can’t help but respect the obvious hard work and dedication of the family. I was invited to a special food and historical presentation hosted by The Berghoff; therefore, I was able to sample a wide variety of dishes. Chef Matt shared some of his favorite dishes from the menu. We started off with appetizers. Holy smokes the pretzel was huge; soft and chewy with a great flavor! Salmon and Rock Cakes and tasty Wisconsin Cheese Curds coated in a chickpea wasabi sauce followed. 1. Butternut Squash Lasagna: it tasted like fall and reminded me of everything that I loved about the season. I suddenly was looking forward to the change of seasons. 2. Braised Short Ribs: tender and full of flavor and savor. They reminded me of the meals my mom would make. Hearty, satisfying, and seasoned to perfection. Nothing was remiss. Next out, the desserts: Chocolate Sachertorte, Red Velvet Cake, Blueberry Cobbler with vanilla ice cream. Oh boy, where do I start? I guess I have to discuss the Red Velvet Cake. You see, I never order Red Velvet Cake when I go out. I’ve been disappointed way too many times. This red velvet cake was superb. So moist….and that cream cheese icing, incredible! Wow! I will order Red Velvet at the Berghoff from now on! These brothers have been running the in-house bakery for 30 years! I could feel the food love! My feelings were validated when the chefs came out to speak with us. Chef Matt spoke with great passion and excitement about his dishes. He truly enjoys cooking and puts his heart and soul into his creations. The goal is to capture what makes people happy with family oriented, relatable meals. Chef Javier was pleasant and quieter. I gathered that he prefers to not be in the spotlight. I admired him coming out to speak with us despite that. He put his foot in those desserts (that means they were fantastic, lol)! We also received a visit from fourth-generation owner Peter Berghoff. The evening was a treat. Sometimes, when I attend hosted dinners, I miss important points discussed because there’s a great deal of activity and information to process (that’s why I usually record the experience and conversations). However, I never miss or forget the feelings stirred whether good or bad. My insides were excited and joyous throughout the dinner due to a number of reasons. I was touched upon hearing the staff express their affection for the Berghoff family with remarkable warmth. They had a contagious enthusiasm for the restaurant as well. The employees have been here for over 25, 30, 40 and 50 years! One employee moved to the East Coast from Chicago and now commutes from the East Coast because of the mutual love between employer and employee. I didn’t get the feeling that this was just a job to them. Numerous times it was stated that everyone there were part of big family. I believed them. I arranged a subsequent tour with Chef Matt to get a glimpse of goings-on behind-the-scenes in the 40,000 square foot space. I guarantee if you met him, you’d adore him. I found him quite funny. He’s just a down to earth guy relishing in what he does. I think he’s a jokester too…hmmm. There’s an abundance of activity within these walls. The multiple kitchens in the restaurant are designed for heavy production. Our first stop was Chef Matt’s main working area. Here is where he braises pot roasts, oxtails, short ribs, beef, and lamb shanks anywhere from 3-5 hours; prepares all of the stews, soups, sauces, corned beef, turkeys, and roast beef. Another area in close proximity is full of potatoes waiting to be peeled, steamed, and sliced cold for the homemade chips and mashed potatoes. If you’ve haven’t tried the chips yet, make it a point to get them! They’re the best I’ve had. There’s also a full-service in-house bakery where all of the bread, cakes, and pastries are made and an in-house butcher shop for all of the meats. You don’t find many restaurant kitchens like this nowadays. I took a peek around the pantry; it was pretty empty! I couldn’t believe how small and empty it was. A restaurant of this size serving thousands of plates a week has a pantry consisting of mostly flour, condiments, and spices. That’s because everything is fresh; something the restaurant prides themselves on. In the basement level of the restaurant lies The Berghoff Café where you’ll find everything from burgers, panini, and classics, to ramen and Poke. The cafe is where Chef Matt takes more liberties and creates pretty much anything he wants. He stated that his favorite dish in the cafe was poke, so I had to try it. I too became addicted. One week I went 3 times for poke on my lunch; it’s that good! I’m so glad that I took this tour because I hadn’t fully grasped the magnitude of what goes on here! I’m also grateful to have been gifted with The Berghoff family’s cookbook containing their family history and favorite recipes after the tour. My son and I recently prepared a few recipes from the collection; they were amazing! So what did I learn about the secret of The Berghoff’s success: Well it looks like they’re still doing things the way they did in the beginning. Serving well prepared from scratch meals in a warm familial environment. In another word, consistency! I hope that you will experience a piece of history by visiting this institution. Have you visited The Berghoff? Leave me a comment about your visit. He’s been in the industry for over 47 years and executive chef for 37 years. He enjoys building things. At the time of the interview, he was in the process of building a tiny house. He’s crazy about poke, so much so, he ate it for 6 weeks straight losing 30 pounds as a result…the weight loss was a bonus. Flo, this was a GREAT read. You just make me WANT to go. Thanks Carol! You need to go, so much history and warmth there! Let’s plan it! Very heartwarming review. Must visit. Next PostChoose Chicago’s First Bites Bash: A Foodies Paradise!